When it comes to having a bespoke suit made, It is important to remember to enjoy the process. 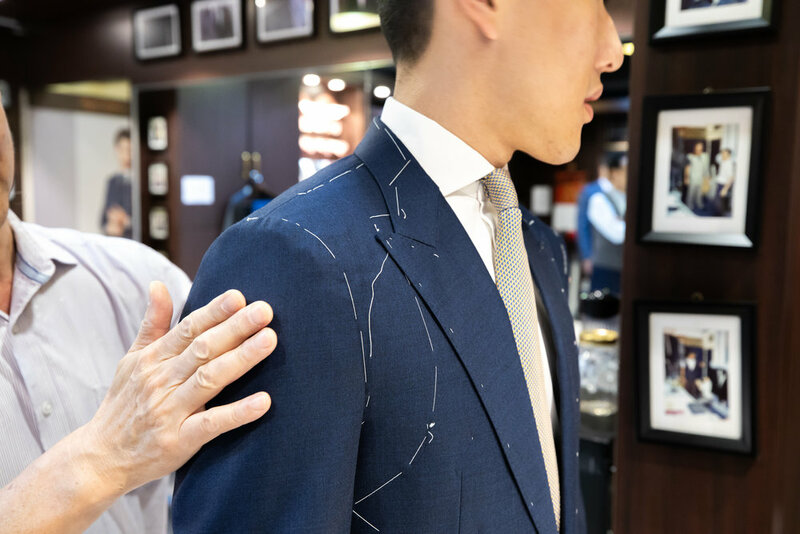 Although it can be overwhelming to some, given that reputable bespoke tailor stores often carry hundreds or sometimes a thousand plus fabrics, you might want to bring a partner, a friend or family member to your appointment for a second opinion. The first thing that happens when you enter a tailor shop is, fabric selection. The tailor will hand you booklets of fabrics, and you’ll go over colors and patterns, weights and thread counts. Once you’ve selected the fabric of your choice, the tailor will go through options related to style. By default, the house cut will be presented to you along with popular side options. If you have something specific in mind, now is the time to bring it up before the fabric is cut for a fitting. Next comes the fitting, the most vital part of the process. This is wear the tailor drafts an early version of your suit for trial. The fitting is where you and the tailor must communicate your requirements, and his suggestions for the fit of your suit or shirt. Trouser and jacket lengths, jacket cut, and shoulders can all be tweaked and examined at this stage. It is recommended to do at minimum 1-2 fittings, more if the tailor thinks they are necessary in your case. After the fittings, the tailor will schedule a completion date for your final trial.